The Full Size Keyboard with Built-in Touchpad from SolidTek is an all-in-one keyboard with all full-size keys and a built-in mini-size touchpad in a minimalist housing. 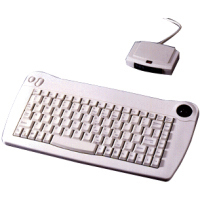 This combo/all-in-one keyboard places the touchpad, including left and right buttons, in the location of the traditional cursor keys (up, down, left, right). This means that the only way to access cursor keys is through the embedded navigation layer on the numeric keypad, accessed through NumLock. Because the touchpad is placed closer to the midline of the user, there is no overreaching for the mouse. NOTE: The touchpad in this keyboard is not a Cirque touchpad. The Industrial Keyboard with Touchpad from SolidTek is waterproof and contaminate-proof, making it ideal for industrial applications or whereever dirt, dust, and other particles may damage a keyboard. Sealed in 100% silicone, this keyboard can be easily washed and cleaned with soap or other non-petroleum based cleaners; the built-in touchpad even incorporates a mousing device into the keyboard, making it an excellent all-in-one combination keyboard for almost any industrial application. Also useful for food service, manufacturing, military, medical, or scientific environments. 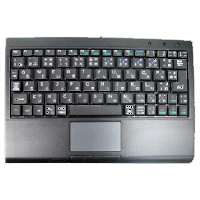 This keyboard offers a compact financial layout with normal access to the numeric keypad. The extra keys (Page Up, Page Down, etc.) are located in a bank above the numeric keypad, and the cursor keys are moved under the shift key. The embedded Cirque touchpad provides mousing in a functional compact layout. Vertical scroll is supported with an optional driver download available online. Also ideal for rackmount / server applications. This compact mini-keyboard from SolidTek has a small built-in touchpad and embedded numeric keypad. 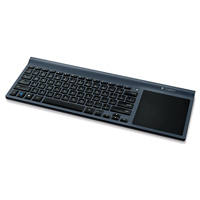 This combination keyboard is ideal for those with small hands who need portability or have use of only one hand. Keyboard housing is black with black keys; all keys are smaller than normal key size. 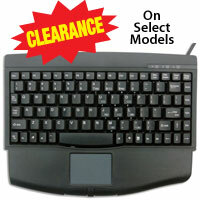 Compatible with Windows XP, Vista, and Windows 7 with plug-n-play capability. 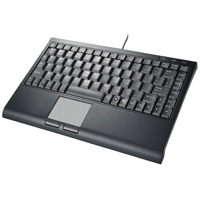 This compact keyboard is slightly larger than the SK595 keyboard and includes a Trackball in the upper right corner for cursor control. The left and right mouse buttons are on the left side of the keyboard at the top. 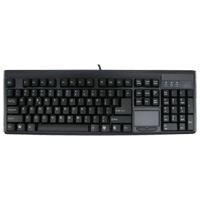 This keyboard comes in an Infrared Wireless (573 series) or Corded (5010 series) model, White or Black, and PS/2 or USB. 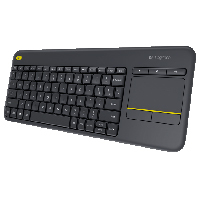 The Logitech Wireless All-in-One Keyboard TK820 for Windows provides all the technology needed to control a computer, or to input data, in a single device. Only 16.1 inches long, the keyboard includes a built-in touchpad seamlessly integrated into its compact, ultra-slim design. Whether used on the desk or on the lap, the keyboard eliminates the need for a mouse, helps to reduce the risk of overreach injuries to the shoulder, and keeps clutter to a minimum. The touchpad measures 4.17 inches square and easily accommodates up to 13 unique Windows 8 gestures. The generous dimensions offer plenty of space to pinch, zoom, and swipe. Cursor control is smooth and precise. The key caps on the Wireless All-in-One Keyboard have concave, softly rounded edges to help the fingers move easily from key to key. The settings on the touchpad can be personalized with Logitech software, downloadable from that company's website. 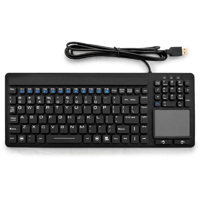 A small Unifying Receiver connects the keyboard wirelessly to the PC; the robust, reliable connection allows the keyboard to be placed in the most convenient location. The unit runs on four, preinstalled, AA batteries (supplied). Spill-resistant construction helps to protect the keyboard against accidental spills of up to approximately 2 fl oz (60 ml) liquid. Note:The keyboard is not spill-proof! Do not wash the keyboard or immerse it in liquid. The design of the keyboard is compact and efficient with a footprint about the size of a piece of paper. The keyboard offers an embedded numeric keypad and built-in Cirque touchpad, along with a palm support. Now all your input devices take up less than a foot of desk space and by using a touchpad, minimal force is needed for mousing. Vertical scroll is supported with an optional driver download available online. New durable aluminum model with metallic finish now available! This is the smallest keyboard available on the market today, having keycaps 0.61" in width. This means the keycaps are around 75% of the normal size, making it almost impossible for an adult to use effectively as their fingers cannot easily hit a single keyswitch. The 77 key layout includes an embedded numeric keypad to offer full 104 key functionality (there are navigation keys in the embedded numeric keypad which are not legended - hold down the FN key to access them.) The key travel distance is shorter than normal, and a scissor-switch mechanism adds to the smoothness and stability of the membrane keyswitches. The Shift, Enter, Space Bar, Caps Lock, Tab, and all bottom and top row keys are significantly smaller than on a standard keyboard. The touchpad has left and right mouse buttons and scrolling feature, and is smaller than a standard touchpad (such as that found in the SK540 keyboard). Note: This keyboard will not work properly if connected to a switching device, adapter, or docking station. It must be connected directly to the computer. 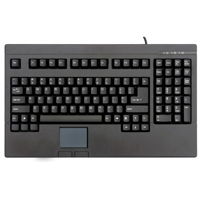 This compact super mini-keyboard from SolidTek has a small built-in trackball and embedded numeric keypad. 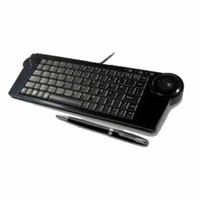 This combination keyboard is ideal for those with small hands who need portability or have use of only one hand. Keyboard housing is black with black keys; all keys are smaller than normal key size. Compatible with Windows 98, 2000, ME, XP and Vista, with plug-n-play capability.